Very, very clean. Beautiful grounds. The food was very good. Unfortunately you cannot be guarenteed to get jnto certain restaurants without a reservation. We tried to make reservations for our 5 day trip on the arrival day and we could not get into several. A little disappointing. Also, the drink quality was not consistent. We found one bar that made awesome drinks but if you asked for a dacquiri somewhere else, they were not good. I would recommend overall but we will be trying somewhere new next time. The property was lovely. It is maintained beautifully. The staff is amazing. Henry our Butler was great and unexpected. Jorge, Fernando and Esteban at the beach bar were always accommodating us. The food is excellent. Property is very meticulously cared for. We stayed in a luxury suite which is the newer building. The rooms were very nice. However, we upgraded to the Royal Monarch Villa and this was hands down an unreal ocean front escape. Second stay here and would not be opposed to a 3rd if the opportunity is there. Highly recommended. Very nice property. Clean, great food, and friendly staff. Amazing property! Staff could not do enough for you . Will definitely come back . Had a wonderful trip, Room, grounds, staff and food great; only problem was a charge that was billed to our room that we didn't charge, was told at check out that would be removed,( they could see signature was not correct) is still on credit card, have sent an e mail hopping will be taken care of. Maybe is was a delay in the billing process. We have been home 3 days. Great compound, food could have been better but the staff makes up for the lack of really good food. Bar staff and pool staff were awesome! It is a nice mix of “party” and quiet, which is great! Juanillo Beach is a short stroll from Sanctuary Cap Cana Adults Only by Playa Hotel & Resorts, and other popular attractions like Punta Cana Beach are within a 15-minute drive. 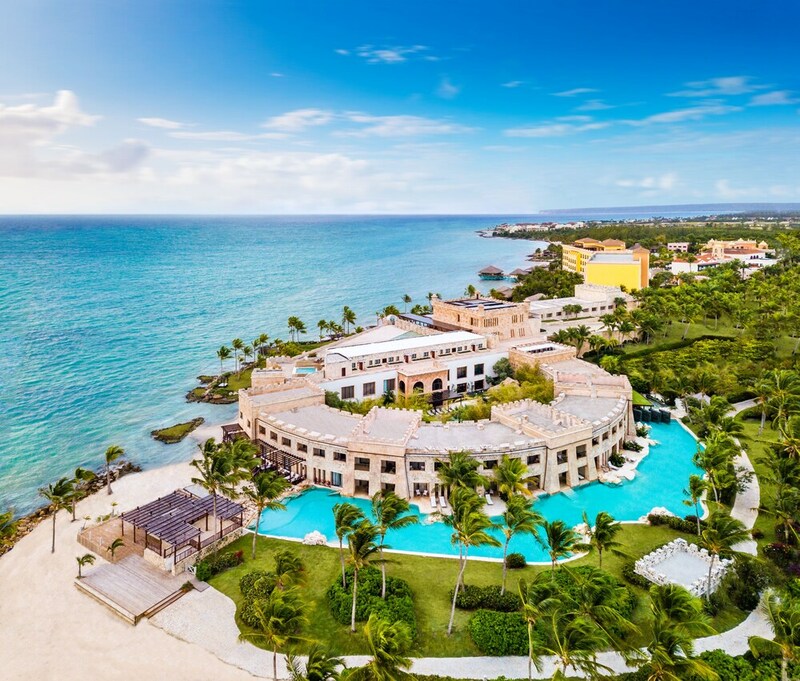 This 165-room, 5-star hotel has 5 outdoor pools along with a private beach and a full-service spa. Free full breakfast is served each morning from 7:00 AM to 11:00 AM. There are multiple options for onsite dining with 5 restaurants, including Blue Marlin, which specializes in seafood. Savor a meal from the comfort of your room with 24-hour room service, or get a quick energy boost at the coffee shop/café. Guests can expect to find free WiFi and 32-inch a flat-screen TV with cable channels. Pillowtop beds sport Egyptian cotton sheets and down comforters, and the bathroom offers a jetted tub, a rainfall showerhead, a hair dryer, and designer toiletries. Other standard amenities include free minibar items, a furnished balcony or patio, and a sitting area. Sanctuary Cap Cana Adults Only by Playa Hotel & Resorts features a private beach, a full-service spa, and 5 outdoor pools. Free valet parking is available if you drive. The 24-hour front desk has multilingual staff ready to assist with dry cleaning/laundry, concierge services, and luggage storage. Other amenities at this adults-only hotel include a 24-hour fitness center, a spa tub, and a sauna. We are very glad to know you were pleased with the hotel overall. We look forward to hosting your stay once again and show you our improvements. Thank you for choosing Sanctuary Cap Cana as your host and for taking the time to rate our services. Thank you for sharing your feedback through this mean. Your comments are truly valuable for us, as this allow us to improve our service levels and product. Thank you for your feedback, we are happy to know that you enjoyed your stay, we hope to welcome you back! Blue Marlin - Beachfront restaurant specializing in seafood. Open daily for lunch and dinner. Alfresco dining available (weather permitting). Casabella - Restaurant specializing in international cuisine. Open daily for breakfast and lunch. Wok - Restaurant specializing in Asian cuisine. Open daily for dinner. Alfresco dining available (weather permitting). The Steakhouse - Steakhouse specializing in Argentinean cuisine. Open daily for dinner. Capriccio - Restaurant specializing in Italian cuisine. Open daily for dinner. The hotel has 5 outdoor swimming pools and a spa tub. A private beach, a sauna, and a 24-hour fitness center are other recreation options. The nearest major airport is Punta Cana (PUJ-Punta Cana Intl. ): 18-min drive, 9 mi/14.5 km. Book a stay in any room or rate category for a honeymoon or anniversary celebration, and receive a complimentary door banner, strawberry and chocolate amenity upon arrival, 1 bottle of sparkling wine delivered to room, 1 special turndown service, 15% discount on spa treatments, and 1 breakfast in bed (must be reserved in advance with concierge). Must book a stay within 3 months of wedding or anniversary date to receive benefits. Full details provided at check-in. Guests must present their official wedding/civil partnership certificate at check-in; date of travel cannot exceed 3 months from marriage or anniversary date. If official marriage certificate is not presented at check-in, the hotel reserves the right to amend the room rate. 15% discount on spa treatments cannot be applied to spa special packages or combined with any other spa promotion or offers. Taxes and gratuity may not be included. No refunds for any unused portion of offer. Spa appointment may be required. Offer subject to availability. Amenities subject to change without notice. Offer is not valid with groups/conventions and may not be combined with other promotional offers. Other restrictions and blackout dates may apply.